This entry was posted in Week in review on 2019-01-27 by kirk.kittell. Tanner Howard, Native American routes: the ancient trails hidden in Chicago’s grid system, The Guardian (2019-01-17). "The whole idea of imposing a grid on this land is from one point of view kind of laughable," said Henry Binford, a professor of urban history at Northwestern University. "The indigenous trail network made a lot more sense, at least in the beginning." Penelope Trunk, Will Jeff Bezos Get Half of MacKenzie Bezos’s Fortune in the Divorce?, blog.peneleopetrunk.com (2019-01-13). MacKenzie has always stood up for her contribution in the marriage. But it’s not so easy for most women. Most women did not work side by side with their spouse to start the most disruptive company in the world. Most women do their half of the team’s work and get very little credit for it. Because when it comes to spousal partnerships, society talks about the stay-at-home spouse like they are a freeloader, waiting to pick up their check in the divorce. Jeffrey Bigham, A Camera is Watching You in Your AirBnB: And, you consented to it., jeffreybigham.com (2019-01-14). I’ve received a lot of requests for interviews and such, but I’m not sure how much more I have to say. I’ve also heard from many guests and hosts. Many guests have similar stories (absent the viral blog post and nice resolution, apparently…). I’ve also heard from a lot of hosts who have indoor cameras because guests rent their home to have huge parties, trash them, and then have trouble recouping their costs. It’s hard to be a guest and a host, and wifi cameras are fuel on the fire. Finally, all of us need to think carefully about how we will live in an increasingly surveilled world. Just because it’s so easy to record everything now doesn’t mean we should. Samuel Beckett, In Our Time (2019-01-17). [42:34] Beckett's incredibly interested in systematic thinking, but it's always systems that are on the point of breaking down. So at one level there's a sense that systems create a kind of hyper-order, but that hyper-order is always tipping over into a kind of absurdity. It's the sort of glitches in the systems, I think, that Beckett's really interested in. #744 - It's No Joke: Prank Musical Greeting Card Earns $36,000/Month, Side Hustle School (2019-01-14). [09:50] Also, even though it was originally a pretty silly idea, the way he's been able to create longterm business value from it is through the execution of the idea. So it's not easy to build those relationships with vendors and make decisions about how many tens of thousands of cards to order. And then when disaster strikes, like that crazy experience with the battery's being duds, it's not a simple thing at all to figure out how to respond and recover. So that to me is where the value is, that is just as interesting as coming up with the initial idea. So if you hear this story and you think, "Oh, well, that's pretty cool but, you know, the whole trick was in the idea", I think the whole trick is in the execution of the idea. Episode 207: Herder on Art Appreciation (Part One), The Partially Examined Life (2019-01-14). [33:33] "Taste in one art roused taste in every other art; there was, so to speak, a harmonious atmosphere in which the similarly tuned strings of all the different instruments vibrated and resonated at a single touch." I think in a lot of this stuff he's really trying to combine all these different elements. I really like that section about how one art can affect another art and you have to be open to that sort of thing happening. [33:54] Yeah, you kind of picture New York City in certain periods where it's a hotbed of artistic expression, and it's not just music, and it's not just avant garde Andy Warhol stuff, it's, like, everything is influencing each other and all the barriers between the different arts go down. This entry was posted in Week in review on 2019-01-20 by kirk.kittell. Sometimes, when I'm looking for houses to buy on Redfin, I get caught up following the old railroad paths that aren't there anymore. They're obvious if you know what to look for. In Redfin they're more obvious because there exist in some places a long continuous gap in the property lines. In the satellite view you can see long curving paths that are matched along their curve by parking lots, unusually shaped property lines, and, if you drive through the area, a clear fit along a graded path. I see these patterns whether I look for them or not. The gully across the street in St. David was an old railroad spur (or was it a continuous line?) down to the mines from the main line along IL-100. In our backyard in Lewistown was an old line that would have come out of the mines in the direction of Depler Springs into Lewistown, not long past an old junction that would have crossed Main Street going east, its scar visible beyond the outfield of Higgins Field—the outfield of Higgins Field itself bearing the scar of the old track before it was moved a bit north and west. In St. David there was that weird sidewalk through the woods that connected Fulton Avenue to Central Avenue that only makes sense, I suppose, in the context of the mines that you can't see. Same, I suppose, with the trails—Fred's Woods, Dave's Woods—where we rode our bikes. And along US-24, on the north side, are the remains, if you look the right way, of either the predecessor of US-24 or a parallel rail line. I'm not planning to bring this post towards a point. It'll roll to a stop when it gets there. Not going to give you any maps either. Find the long loping curves and the displaced grades yourself if the spirit moves you. When I lived in Newman, in Douglas County, driving north through Broadlands to get back to campus, you could see the remains of a line that would have gone from Villa Grove to Westville. 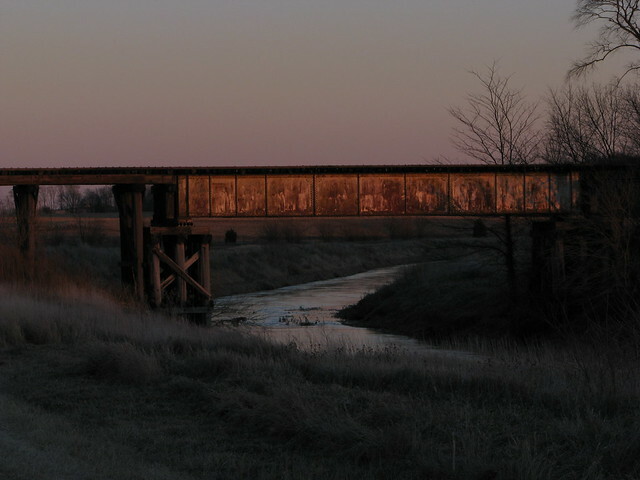 At the Spoon River crossing by IL-116 west of London Mills, on the west side of the current highway are the remains of the old highway bridge over the river. And on the east side there were pylons of an older bridge. I assumed it was also a road bridge. Once in Google Earth I pulled up historical imagery and it was a railroad bridge, the railroad feeding out of the old mines through London Mills and up into flat country. Go upriver of that crossing, past the junction where the Spoon meets the Cedar Creek, until it crosses under Fulton County Road 20—Indian Ford Bridge, formerly one of the old metal highway bridges of Fulton County. Cedar Creek is the southern boundary of Ingersoll Scout Reservation, where I spent several years camping and several years working. ISR was patched together from old farms and if you knew where to look—and it wasn't really looking so much as walking through the woods and the stinging nettles feeling for clues—you could find the remains of old barns, old buildings, old electrical boxes where a house might have stood on the old County Line Road that had been submerged by the manmade Lake Roberts in the 1970s. If you could feel the old overgrown fields, you could find the old barbed wire that had been taken off the old fenceposts and rolled up where an old tree also used as a fencepost had consumed it. Old trails. They're not even history because history is written down. Old trails are an enigma, living forever until found by strange wanderers or destroyed forever as they're subsumed by development. In the final accounting it probably doesn't matter which. Earlier this week I learned about the Old Indian Trail from Cadillac to Traverse, Michigan. And I also found this article in The Guardian about how the shape of Chicago and its surrounding areas are built to the shape of old native trails: Native American routes: the ancient trails hidden in Chicago’s grid system. And that played on something in my mind that I've meant to look up for a long time: in my internal movie of Lewis and Clark traveling from the Mississippi River to the Pacific Ocean, I have an image of people traveling in canoes up and down rivers, and hacking through temperate jungles, passing through unseen land, occasionally popping into a clearing where there were strange people just hanging out around a campfire, and then moving on through the jungle. I don't think that's how it went, but that's the baseline mental image. Obviously they would have followed trails instead of bushwhacking. No one would get all the way to Oregon just by stumbling through the undergrowth. What trails did they follow? What old trails are still there? This entry was posted in Uncategorized on 2019-01-19 by kirk.kittell. Elisabeth Braw, Trucking Is the Security Crisis You Never Noticed, Foreign Policy (2018-09-19). "Transportation is too cheap," Huster said. "In the past, the fee per container going from Asia to Europe was often 2,000 euros [$2,300]. Today, it's 200 euros [$233]. And with freight shipping that cheap, people expect the truck part to be correspondingly cheap." According to a new survey by PwC, Amazon Prime customers value the unlimited free delivery offered by the service most, with 72 percent of them saying it's the main benefit of the service. Lowell L. Getz, A Silent Witness To The Growth Of The University of Illinois, Illinois Digital Environment for Access to Learning and Scholarship (2016-08-15). For undetermined reasons (there are several unverified suggestions), this stream was named the Boneyard. As Champaign became larger and university buildings were constructed near its banks, the Boneyard became essentially an open sewer. So foul was the water, in the early days of the University, it was common-place for tug of wars to be conducted over the Boneyard, the losers being dragged into the stinking water. Penelope Trunk, To do something big, aim to be irrelevant., blog.peneleopetrunk.com (2018-12-23). I don’t believe specialization is bad. But I do believe it’s scary. You could get hurt, you could miss your big chance, you could be disappointed, you could fail publicly. But if you don’t learn to take risks by specializing early then you won’t be able to be great at anything later in life. Jeffrey N. Wasserstrom, The Year in Chinese Science—And Science Fiction, The Daily Beast (2013-12-29). Kat Rosenfeld, The Millions Will Live on, But the Indie Book Blog Is Dead, Vulture (2019-01-09). But it's also true that the site's sustainability depended on attracting young writers who were willing to work for no or low pay in exchange for the mere possibility of a career boost. Reasonable people can disagree on whether such an arrangement is always detrimental to the literary sphere; certainly, the Millions couldn't have existed in its current form without it, especially in a world where readers still balk at paywalls or subscription models. But what seems undeniable is that unpaid (or unreliably paid) blogging is a young person's game. To a one, the Millions staffers I spoke to described loving their time at the site — but also finding the commitment impractical, and then impossible, as the responsibilities of adulthood, career, and family (particularly children) began to accrue. Huawei And The Tech Cold War, The Sinica Podcast (2019-01-10). 641: The Walls, This American Life (2019-01-04). 664: The Harsh Reality of Innovative Companies, HBR IdeaCast (2019-01-08). [04:51] You want to celebrate the learning that comes from failure, not celebrating the failure. There's productive failures and there's unproductive failures, and you want to judge failures in terms of how much you learn. So, if you tried something new, and it's risky, and it doesn't work, so it quote-unquote fails, but you've now learned something about the path forward that could be attractive, that's worth celebrating the learning from that. If you just came up with a bad design or did sloppy work and you failed, that's not worth celebrating. The focus has got to be on the learning, not the failure. This entry was posted in Week in review on 2019-01-13 by kirk.kittell. Covering the status of poll results has a useful place in the process of electing people to office. It's a glimpse outside of the relatively small region of what an individual can see and hear and know. I find it easy to convince myself that my experience must be similar, if not the same, to most others. Especially for national offices, the polls are a quick reminder that at least 40% of the people out think differently. But it's just a glimpse. It's not awesome. It's not the story, outside of weird and unexpected changes. It should be at most a sidebar to something more substantive about the people represented by the polls, whether the candidate or the voters. At the end of the 2008 campaign, Washington Post ombudsman Deborah Howell sorted Post political coverage over the previous year and found 1,295 horse-race stories compared with 594 stories about the issues. This ratio seems defensible, seeing as the who’s up/who’s down of the horse race can change daily. Issue stories don’t need that sort of constant revisiting, especially if they’re done well. Honestly, polls don't need that kind of revisiting either. Not every change in a poll is significant, and not every individual poll needs its own article. That should all be a slow-moving collection of numbers, converging to mean something at key milestones. Day-to-day numbers are useful for selling advertisements, not for deriving meaning. On the other side, a candidate's stance on an issue might not need constant revisiting, but that issue is connected to other issues, people, etc., and those network effects deserve the attention. It’s not antidemocratic for journalists to measure support by checking polls, campaign donations, audience size and endorsements. In fact, such signaling makes democracy possible. I don't think that the horse-race stories are antidemocratic. That seems a bit of a strawman. The issue is that it's out-of-balance with what would be useful in terms of electing candidates to office. By giving voters a window on the closed world of insider politics, horse-race stories help focus reader attention on the races. Without the work of election handicappers, coverage would come to resemble an endless series of policy white papers that nobody reads. I can't understand this comment except as maybe a second- or third-order effect of horse-race politics stories. Poll numbers are representative of what outsiders think, not insiders. And horse-race stories don't help focus readers on the races, but on the poll numbers. I agree that white papers are boring, and nobody outside of specialists and unusually interested people should be expected to read them, but there is plenty of room for connecting the dry information in a white paper to the effects it will have on the messy real world and the people that live in it. Cover the horse races on the weekend. Then for their sake and ours, let them rest. This entry was posted in Uncategorized on 2019-01-11 by kirk.kittell. Jon Udell, Critical mass and social network fatigue, blog.jonudell.net (2007-02-06). Years ago at BYTE Magazine my friend Ben Smith, who was a Unix greybeard even then (now he's a Unix whitebeard), made a memorable comment that's always stuck with me. We were in the midst of evaluating a batch of LAN email products. "One of these days," Ben said in, I think, 1991, "everyone's going to look up from their little islands of LAN email and see this giant mothership hovering overhead called the Internet. How Super Mario became a global cultural icon, The Economist (2016-12-24). There is one aspect of his context, though, that matters: fun. Mr Abe turned up in Rio dressed as Mario not just because Mario is instantly recognisable around the world. He embodies the delight of play. Talking to the New York Times in 2008 the reclusive Mr Miyamoto explained that people like Mario and his ilk "not for the characters themselves, but because the games they appear in are fun. And because people enjoy playing those games first, they come to love the characters as well." Colin Lecher, Why robocalls have taken over your phone, The Verge (2018-11-07). Frankie Huang, The Rise and Fall of China’s Cycling Empires, Foreign Policy (2018-12-31). Meanwhile, Shanghai is adding more docking stations, perhaps a return to the boring, but infinitely more manageable, version of the bike-share. There's always going to be a small audience for cycling—but it turned out to be a bad dream to build giant firms on. Seth Godin, You can’t outtrain a bad diet, Seth's Blog (2019-01-03). Kickstarter: Perry Chen, How I Built This (2018-12-31). [22:28] In some ways we made every mistake in the book. We did one lap that way. Classic stuff like people with experience telling us, "You know, you shouldn't do something this way", and us being like "Well, we appreciate that, but, like, you know, it'll be different for us". And then of course it's like exactly what they said happened. Well, duh. 424 - Byron Allen: How To Make History in Your Dream Industry (A Story About Outsmarting The Standards), The James Altucher Show (2019-01-03). #732 - PE Teacher Resells Concert Tickets, Earns $12,000/Month, Side Hustle School (2019-01-02). This entry was posted in Week in review on 2019-01-06 by kirk.kittell.